Board absent: Tom White, John Roe, Tim Jenema, Michele Andrews, Dustin Webb, Cody Sprattmoran and Don Clewley. Chad opened the meeting at 6:30 p.m. There was no quorum present. March meeting minutes were formally approved. Kim led the discussion on the financials. Kim had presented the balance sheet for NMMBA. She had designated separate accounts for the different trails. Among those accounts was one labeled General funds. Contributing to this total was the revenue generated by the Beard of Zeus fatbike race. Also all costs associated with that race were volunteer generated so no billing went out. Kim also touched on the Morley fund. Betsy Morley had indicated that some of the monies were to be used for the future pavilion to be located at the Supply road trailhead. Kim is advocating that the fund be put into a separate interest bearing account. As to the pavilion, Cherry Capitol Cycling Club(CCCC) is still interested in contributing to the pavilion. So any discussions going forward should include Bill Danly, president of CCCC. Other notable numbers from the financials include account balances. Nate unveiled the color representing Traverse City Trails Fest(TCTF). Aligns with the DNR and also presents a high visibility to it that will promote safety. Nate also showed some more apparel samples which will be marketed to the local bike shops(LBS). NMMBA logo will always be evident on all merch. T’s, cups, caps, etc. He will present a sell sheet to the LBS. Looking down the road the LBS will have the technology and capability to sign up memberships in store. Either through an ipad or scanning a QR code on a hangtag. Nate also proposed logowear for the board members in the form of a vest or jacket. It would be a way to identify board members at functions and events. If we went with this idea the logo would identify and label each “board member” instead of title. Another idea was using a lanyard with a card inserted to identify each board member. Could be incorporated into branding. More to come. Nate also proposed the idea of a guided mountain bike service. The idea being that you purchase a membership to NMMBA and are awarded a free guided tour on the VST. These tours would be led by our current members or board members. It would be another way to engage our membership base. Discussion about eliminating the intimidation factor people have when heading out to ride. These tours would have both a leader and sweeper. No one gets dropped. 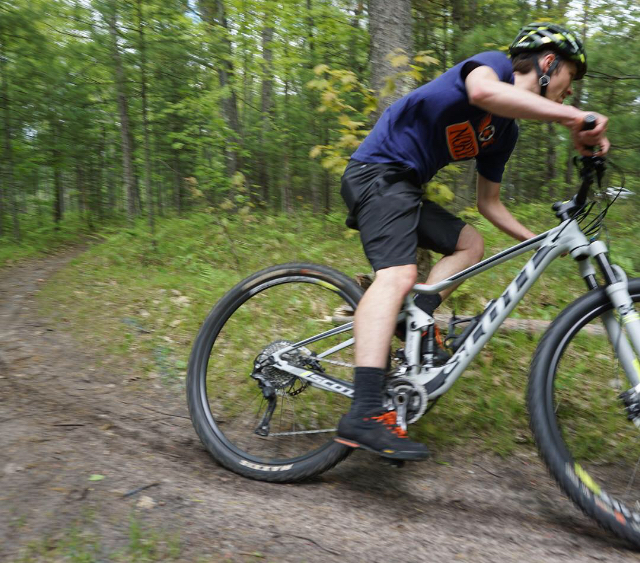 A bit of history and trail etiquette would also be a part of the tours for newer riders. This program would benefit both NMMBA and the bike shops. It was suggested that we start with one shop and grow it from there. City Bike shop in Traverse City and McLain’s in Cadillac would be the pilot programs. Nate to meet with the merchandise committee. Check in with Mark Mueller as to the progress on the marketing doc to be presented to Nate. Mike led this discussion as to the upcoming MSB race. And what is needed. With trails having been added and re-routed, new signage is needed. Also new maps for the trailhead kiosk are needed. New riders heading out from Supply will not have current information. Could lead to some lost riders. Safety is paramount! In other MSB news, race permit is still not in hand. GPX file with new routes should be completed by Monday the 15th. Strombolis Lake section is complete and just a bit more work is needed on the ditch pickle section. McLain race team is set to mark the course. Steve brought the board up to date with the Insurance situation. Received a quote from Fischer agency in Bellaire. Policy premiums are very close in cost. Most likely from quotes coming from the same carrier. Michigan Miller. Few more numbers have to come in then board will make their decision as to remaining with Larkin or switching companies. finalizing the pavilion over the next couple of months. Working on Bear Claw Epic-Saturday September 28, 2019. McLain is marking the course this year. Woohoo! Thank you!!!!!! with DNR. Goal is to have the Strombolis Lake trail 100% complete by TCTF. track. Work will commence IMMEDIATELY after MSB and DNR approval. It’s becoming a tradition just as exciting as race day itself! Tom White talks you through the 2019 Mud, Sweat and Beers course! Things have changed a TON since the first few editions of MSB. Those races rarely strayed far from the wide-open and fast Vasa Pathway, and while still absolutely thrilling, those events didn’t offer riders much more than a tease of singletrack. When NMMBA stepped up to help design a course, the goal was always to ask more of the rider. We wanted to balance a safe, fun, and accessible route with something that would challenge more than just the engine of the rider, but also demand some amount of technical skill and tactical nous as well. We think our 2019 is the best iteration of MSB yet! Tom’s turn-by-turn narration is included below, and we also have a file that includes much of the course available here. We do want to stress that riding on private property anytime outside of race day is prohibited. You can access the course from a number of places, and if you hop on the 25 km from Bunker or Timber, you’re going to see markings in no time. - Same start and finish as last year. - Ample passing for the first 5.5 miles. - The first piece of single track after the private land is the "F-Bomb"
area. We plan to revamp this crappy section so it flows. - A fun portion of the winter sports trail is next. rolling hills in Jack Pine Valley. track to intersect the new section of VST by Post #5 (Saplings). track in Strombolis Lake (we will build in April). - Same gas line and single track as last year (The Other White Meat). - New section of VST (Ditch Pickle and Tingling Bits) is next. single track and then onto a downhill piece of Perch Lake Road. that will take you to the base of the Wall. seldom used piece of Tom's Cruise. - There will be a safer merge with Pale Ale riders. - Approximately 23.5 miles long. Want to help Tom, Mike, and the whole TC Trail Crew get the course ready for race day? Join us at Mt. Holiday on Sunday, April 28 at 12:30. You can stay up to date on the game plan right here.